Scientists from the Smithsonian Tropical Research Institute (STRI) and officials from Panama’s Ministry of the Environment (MiAmbiente) visited the Mamoní Valley Reserve, where release trials are underway to release Limosa Harlequin (Atelopus limosus) frogs. 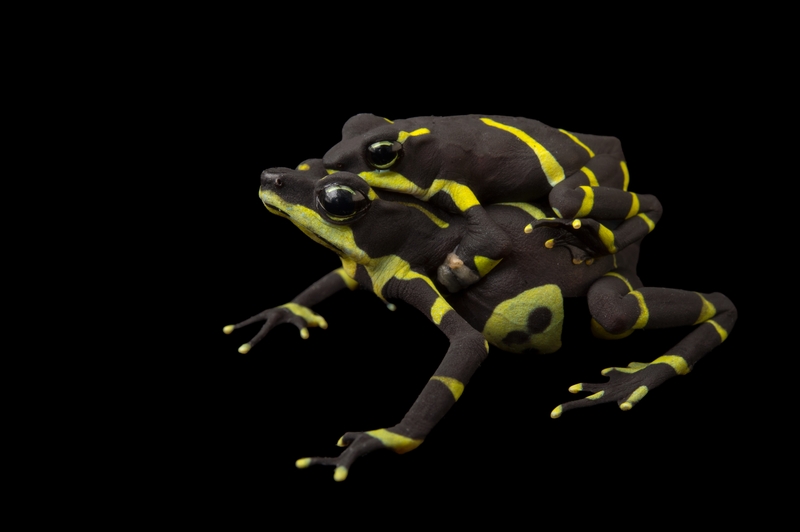 These frogs were bred in captivity and are the descendants of frogs collected a few years ago in the same area. MiAmbiente was represented by biologists Erick Núñez and Anthony Vega, technicians from the Department of Biodiversity of the Office of Protected Areas and Wildlife. They were accompanied by STRI staff scientist Roberto Ibáñez, director of the Panama Amphibian Rescue and Conservation Project (PARC), and Juan Maté, STRI’s manager for scientific affairs and operations and institutional liaison with MiAmbiente. PhD student at the Smithsonian-Mason School of Conservation at George Mason University, Blake Klocke, who is currently conducting this research, hosted and guided this visit, together with his field assistant, Mirjana Mataya. Some of the frogs are from the initial release trial conducted in the El Valle del Mammoní Reserve by Panamanian PhD students from Virginia Tech, Daniel Medina and Angie Estrada. They kept the frogs inside enclosures in this reserve to protect them from predators and so that they could obtain samples to determine if they were infected by the chrytrid fungus (Batrachochytrium dendrobatidis). In a second release trial, Blake Klocke freed these and additional frogs. In this phase of the investigation, one of the objectives is to determine if it is necessary to keep in enclosures before releasing them completely. Some of the frogs were equipped with radio transmitters that allow researchers to follow their movements and estimate the size of their territories. The visit with MiAmbiente officials was aimed at monitoring the release trials and the progress of research. Blake Klocke showed them how the radio-telemetry tracking system works using mini-transistors. This technological tool, applied to scientific research, allows us to follow the movements of these small frogs. Frogs without radio transmitters were certainly harder to observe. Likewise, measurements of the size and weight of frogs were obtained and samples of their skin were collected with swabs for detection of the chytrid fungus. At this point, the frogs have been kept close to the point of release. However, based on the data being collected, researchers will be able to estimate the future dispersion and survival of the frogs. 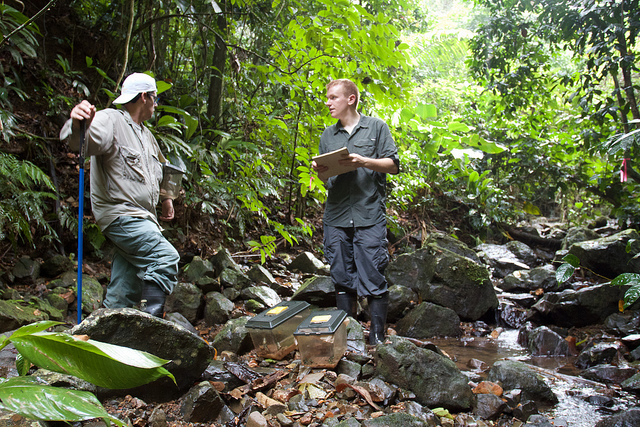 The initiative to advance the release trials is part of the Panama Amphibian Rescue and Conservation Project, known colloquially as PARC and administered by the Smithsonian Tropical Research Institute under the supervision of MiAmbiente. This project is a collaboration among several organizations including Cheyenne Mountain Zoo, Houston Zoo, Smithsonian National Zoological Park and New England Zoo. It has been supported by a long list of sponsors, among them Minera Panama SA. PARC has two facilities, one at El Níspero Zoo in El Valle de Antón, Coclé, now known as PARC El Valle and the other in Gamboa in the Panama Canal Watershed, known as PARC Gamboa. The PARC El Valle facility received the first rescued frogs, which had been temporarily kept at the Hotel Campestre in 2007, an initiative of the El Nispero Zoo and the Houston Zoo, with funding from the latter as an emergency response to the reduction in numbers of amphibians due to the mortality caused when the fungus arrived in El Valle de Antón in 2006. In 2009, this facility in El Valle came under the umbrella of the PARC project, and has continued its operation within the El Níspero Zoo. In addition, in 2009, PARC Gamboa initially began with the building of facilities at Summit Municipal Park, before relocating to its current location in Gamboa in 2012 to improve and expand capacity for ex-situ conservation of amphibians and create an additional backup at a second site. The PARC project is characterized by the result of the joint effort of multiple organizations and large numbers of people who, over the years, have contributed to the conservation of Panama’s amphibians. MiAmbiente and the STRI have an inter-agency collaborative agreement under which they work closely on the implementation of the Amphibian Conservation Action Plan in Panama approved in 2011. The Plan aims to ensure the conservation of amphibian populations through the implementation of actions that promote research and management, both in situ (in their habitat) and ex situ (outside their habitat) in addition to promoting the education of society in general. This plan integrates specific research, conservation and education activities in the short and medium term with the goal of safeguarding our natural heritage. This visit served as a joint verification by STRI and MiAmbiente on the progress of the project. An important milestone has been reached in the implementation of this Action Plan, as this is the first time in Panama that an amphibian conservation project is executing the phase where the behavior and survival of frogs reared in captivity is being investigated by exposing the animals to their natural environment. The results of these release trials will be of great use in guiding future efforts to re-establish the populations of certain species of frogs at sites where they have decreased in abundance or disappeared. This entry was posted in chytridiomycosis, Press release, reintroduction by admin. Bookmark the permalink.